Made some big decisions and changes in how I acquire and enjoy music. A little less than a year ago, I stopped purchasing CDs all together and instead pay for mp3s of albums and songs I know I definitely want and then buy the occasional vinyl record if it's something to be especially cherished. Now I've taken the next plunge and am trying out different paid streaming services (vs. the free versions I've had a hate-love relationship with for too many years). My feelings are still mixed on this easy-come, easy-go relationship to music and the companies behind services like Spotify and YouTube Music, which appear to be screwing the creators when it comes to getting paid. But due to concerns about time, space, money and the environment, streaming services and digital purchases make most sense... and the occasional vinyl record for the soul. I'm curious: do you use streaming services? If so, which one(s) do you use? I'm probably going to decide between Spotify and Amazon Unlimited, the later being more affordable as a Prime member but having less social connections and 3rd party playlists. Enough about all that because no matter what, I'm not stopping to make my quarterly "mix tapes". Here are my favorite songs from the last quarter of 2018 (October, November, December). 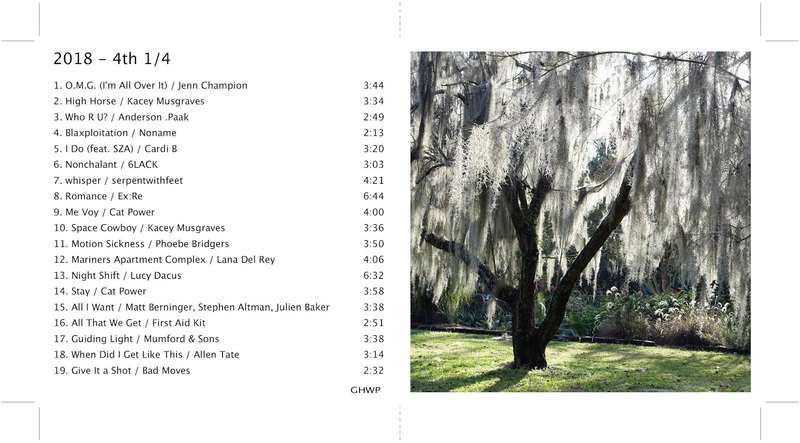 Mix CD of favorite songs from autumn 2018 - featuring a photo from the Botanic Garden in Gainesville, Florida. As usual, the mix spans exactly one audio CD - and I burned one copy to keep next to the cassette deck + CD player boombox I recently acquired for our guest room. There are probably two copies going out in the mail as soon as I get printing paper again for my printer (in this digital life I don't even know when exactly I must have used the last piece of printing paper). For everyone else, you'd probably just want to listen to the 2018 - 4th 1/4 list on Spotify anyway. Or you could check out videos for the song on my Pinterest Music board.